Lydia McCauleys music is best described as beautiful and passionate. Her songwriting is shaped by Celtic, Medieval, and Appalachian musicand her own pilgrimages around the world. This combination portrays a journey through the past and into the present as Lydias songs take her listener to an inward landscape, where the simple truths of her lyrics illumine the soul. Born in Seattle and raised in the southeastern United States, Lydia grew up studying classical music as a child. When she was sixteen, her family moved to the Appalachian mountains of Tennessee and it was there that she began learning about the Celtic music that had been brought over the waters from the British Isles. She documented folk music from the Appalachian region at Berea College in Kentucky while working at festivals and at the schools museum. The echoes of the British Isles were what truly inspired Lydia. She now lives in the Pacific Northwest with her husband and co-producer Kurt Scherer. Lydia McCauleys music is a combination of contemporary sounds mixed with an older tradition that is categorized as New Age or Folk. As with most songwriters, her music follows the dynamic journey of her own life and is pretty true to form. This means that each album is crafted from the experiences of the particular year in which it was written. Lydia grew up playing music from the age of five. Her early years studying piano and singing in choirs gave her a good base for songwriting, which began when Lydia was eighteen. In the mid 1990s Lydia formed her own music label, Brimstone Music, and launched a professional career as a touring and recording artist. With the companionship of her husband/co-producer Kurt Scherer, Lydia has released six full-length albums that receive distribution across North America. Lydias band tours with her in the U.S. and Canada. She also performs with RIVER, a three-composer concert program which features Nancy Rumbel, Jami Sieber, and Lydia McCauley. 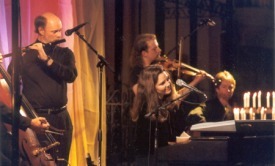 Lydia McCauley and her talented ensemble tour the U.S. and Canada, performing by candlelight in Cathedrals, making appearances on television, at festivals, performing art centers and other venues. Comments: Lydia McCauley is our featured artist. Post your reviews and comments about Lydia McCauley here! Want to write a review about Lydia McCauley's music? Or perhaps you would like to share your experience of seeing Lydia McCauley in concert. Feel free to use the following form to post your reviews, comments and thoughts concerning our featured artist! Please login to write your comments about Lydia McCauley.